HYANNIS – For the second straight year, a Hyannis Mets catcher has been presented with the Daniel J. Silva Sportsmanship Award by the Cape Cod Baseball League. Chris Robinson of the University of Illinois follows in the footsteps of last year’s Mets backstop Richard Mercado in capturing the Silva award, voted on by the ECAC umpires who work the CCBL Games and selected by ECAC Supervisor of Umpires Nick Zibelli. The award is named after former Cape League Commissioner and umpire-in-chief Dan Silva, who helped organize the 1963 merger of the Upper Cape and Lower Cape Leagues into their present format. He was inducted into the inaugural CCBL Hall of Fame in 2000. Robinson was presented with the Silva Award before the Mets’ regular season finale against the Cotuit Kettleers last Sunday. 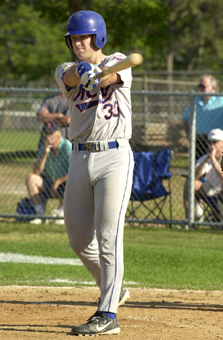 “Chris is a very affable player who get along with everyone,” said Hyannis GM John Howitt. “He’s done a nice job for the Mets this season and has enjoyed a fine season. Robinson ranked second on the Hyannis squad with a .294 batting average, dipping below the .300 mark after playing in a doubleheader last Saturday against Wareham and Falmouth. He was named as one of the two catchers on the Cape League postseason all-star team, along with Frank Curreri of Yarmouth-Dennis. The hard-hitting Robinson was named first-team All-Big Ten by the league coaches. The Dorchester, Ontario native earned the first all-conference honor of his career after hitting a team-leading .359 overall and .342 in the Big Ten. 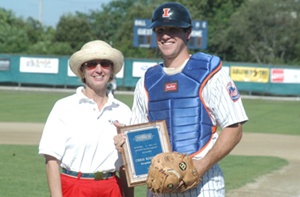 Hyannis Mets catcher Chris Robinson, accepts the Daniel J. Silva Sportsmanship Award from League President Judy Scarafile before the Cotuit at Hyannis game Sunday August 8th. From the start of the Big Ten season April 2nd until the end of the season the sophomore hit .415 (56-for-135), collecting all nine of his home runs, 56 of his 65 total hits and 37 of his 38 total RBI. Robinson started at catcher in 51 of Illinois' 55 games in 2004 and caught all but 10 innings of Illinois' final 39 games. He earned Big Ten Player of the Week honors April 26 after hitting .688 that week, including .667 over a four-game series against Indiana. Robinson also hit a pair of grand slams and set a career-high with eight RBI in a midweek game May 4 against MacMurray. Presented every year since 1973, the Silva Award recognizes the player who exhibits the best sportsmanship in the league. Robinson is the sixth Hyannis player to be honored, joining former Mets Mercado (2003), Curtis Sapp (1999), Will Vespe (1988), Jim Howard (1983) and Brick Smith (1980).